ComplianceSigns.com CONNECTION: Fatal Traffic Crashes Increased in 2016 - What Can Employers Do? Fatal Traffic Crashes Increased in 2016 - What Can Employers Do? According to a recent DOT announcement, 37,461 lives were lost on U.S. roads in 2016, an increase of 5.6 percent from calendar year 2015. The number of vehicle miles traveled on U.S. roads in 2016 increased by 2.2 percent, and resulted in a fatality rate of 1.18 deaths per 100 million vehicle miles travelled - a 2.6-percent increase from the previous year. 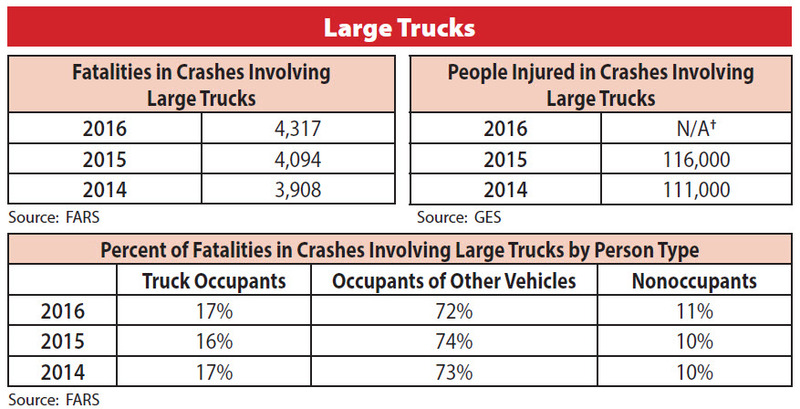 These numbers come from the National Highway Traffic Safety Administration, which recently released fatal traffic crash data for calendar year 2016, collected from all 50 states and the District of Columbia. Fatalities in crashes involving large tucks increased from 4,094 in 2015 to 4,317 in 2016. Of those deaths, just 17 percent were truck occupants. The remaining deaths were occupants of other vehicles (72 percent) or non-occupants (11 percent). Distracted driving and drowsy driving fatalities declined, while deaths related to other reckless behaviors – including speeding, alcohol impairment and not wearing seat belts – continued to increase. Motorcyclist and pedestrian deaths accounted for more than a third of the year-to-year increase. 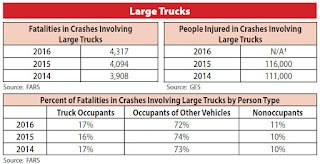 Although the report does not give data on work-related traffic crashes, the increase in fatalities involving large trucks indicates an area of concern for trucking companies and other employers with commmercial drivers. Preventing work-related roadway crashes requires strategies that combine traffic safety principles and sound safety management practices. Employers can promote safe driving behavior by providing safety information to workers and by setting and enforcing driver safety policies. Crashes are not an unavoidable part of doing business. Employers can take steps to protect their employees and their companies.